eat, drink & be vegan: New Food Pics and Cookbook Giveaway! New Food Pics and Cookbook Giveaway! Well, it seems like forever since I posted some of the new recipes I've been plucking away at. Thought I'd give you a looky loo at some stuff! First, to cake! The frosting can be smoothed on more precisely, I just love the look of it draping over the cake. Think I may have posted about this Gluten-Free Vanilla Cake before, but I've since tweaked it, and well, who doesn't want to see a new photo of cake with luscious frosting like that?! 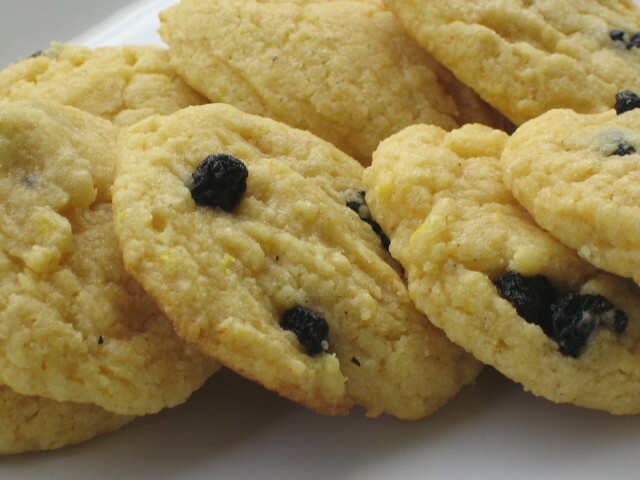 These gluten-free lemony cookies have a slight crunch from the cornmeal, but with a very satisfying chewy texture. I've included more gf goodies in this book, since folks have been asking for them. Jerk Chickpeas. Spicy, bold seasonings, mixed up with chickpeas in a one-pot dish, ready to serve over brown rice. Dinner is done! Especially good with some guacamole on the side for cooling effect! These are Welsh Cakes, which I posted about before, but have tweaked to give a baking option instead of pan-frying. We like them much better this way, and they are also far easier to make, just scoop up batter, on to the tray, and into the oven! Beans and greens are the cornerstone of a nutrient-rich vegan diet. Get 'em all in one bowl with this warming, delicious soup. I developed this raw tomato sauce at the end of summer when there were glorious organic yellow tomatoes at our farmers' market. 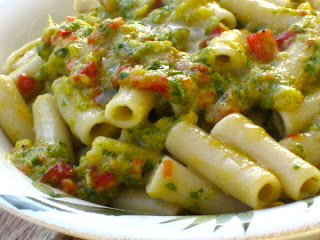 It started out as a salsa, and I morphed it into a fresh sauce to toss with pasta. We enjoyed this several times at the end of August, it was so light and easy for a summer's night, and yet really satisfying with all the fresh ingredients, herbs, and aromatics. I would LOVE one of your cookbooks. I really need to spice up my cooking. I'm vegan but need to get more creative and one of your books would be perfect for the task! Oh I would love to win this!! I would love a copy of any of your cookbooks! I would LOVE one of your cookbooks! As a new vegan, I have yet to amass very many. Ohh! I want to try the Welsh Cakes this weekend! My Great Grandmother came to Canada from Wales in 1926. Pick me! That raw yellow tomato sauce looks incredible! I hope you post the recipe! I don't have any of your books but want them all, hopefully I win! Oh Dreena, those recipes look fantastic, as usual! Did I tell you that I take, or more exactly "used to" take "Vive le Vegan" with me when running errands in case I stop at the market with a urge to cook something? Well, it turns out I must have left it on a counter somewhere. Glad for the lucky one who found it, not so glad for me, who also happens not to have Everyday Vegan, by the way :). What beautiful pictures! They make me hungry and also are inspiring me to try to replicate the process. How is it that everything you make elicits grumbles from my stomach? Those dishes look so amazing! I can't wait for the next book to come out!!! I have ED&BV and love it - so I've been pining for your other books. Your recipes are great for families and almost always kid friendly. Would love to win either Vive or ED&BV since I'm always purchasing one of them to give as a gift or recommending all three of your books. Please pick me! A friend of mine recently had her 3rd baby and she has been trying to shift the whole family over to a vegetarian diet. She is very interested in veganism but she feels a like she won't know how to make anything. One of your books would be perfect to get her started and show her how easy it is. I'd love to win a copy to surprise her with - she could really use a boost right now. I have all 3 of your cookbooks and love them all. If I won one I would give it to my Mom who went vegan this year. I made your chocolate layer cake for her birthday a couple of years ago and she said it was the best chocolate cake she'd ever had! I don't own Vive le Vegan! I'd love to add it to my library. Wow! Not to sound over the top, but I would LOVE one of your books. I have Been using the recipes you post for months now. My husband isn't vegan, but he has loved them! I would love to buy all of your books, but we just finished med school & money is a bit tight:). Thanks for the opportunity. You are seriously inspiring! Love the blog. It would be great to get one of your cookbooks! Thanks for this contest! I'd love to win one of your cookbooks. I'll be checking back for sure. Those recipes look so delicious! Chickpeas are my favourite, so any new chickpea recipe is always good!! I have been meaning to get ED&BV, but keep putting it off. I finally went to get it and our local bookstore no longer had it. Grr. While I'm not a vegan, I do very much enjoy your recipes and I use them to help me reduce the amount of meat and dairy I eat. Crossing my fingers and toes that I win! Crossing my fingers on this one since I don't own any of your cookbooks yet! Absolutely love all your cookbooks and I am constantly inspired by them. I use them all the time to cook for others and they are always impressed. My neighbor is transitioning to veganism and I would love to give her a copy of one of your books. I purchased eat drink and be vegan at the recommendation of my naturopath. I have bookmarks on every other page! This book is is valuable tool in my toolbox to convince my hunting, meat-eating husband that he doesn't need animal products, nor does our two-year old son. Well, I have all your books so far, so not really vieing to win this. Just wanted to say its a pleasure to be testing recipes for the new one. I have found several new favourites and am looking for more! LOVE LOVE LOVE that there are more GF recipes! As a recently diagnosed Celiac, this is much appreciated. I would so love to win one of your cookbooks! I have one of your cookbooks and love it. Would love to have another one. We have been Vegan for 6 1/2 years. You do such a wonderful job with the directions in your books. The one I have is: The Everyday Vegan. Love it!!! Oh I want that cake right now! A cookbook would be nice, too! Woo hoo! I would love to win this! I'm sad to say I don't currently have one of your cookbooks and am not currently vegan, but I sure am trying(cursed cheese addiction)! Perhaps some new ideas is just what I need to kick myself in gear and away from the ice cream! That vanilla cake looks fantastic. My kid's favorite is vanilla. And we are all gluten free and vegan. OH!! Pick me, pick me! No, seriously, I DO have all your cookbooks but would LOVE to have one to share, as two of my sisters are ALWAYS asking to borrow them - especially for the gluten-free options. I love this blog! So many wonderful ideas (and recipes too!). I haven't yet had a chance to buy one of your books, so this is a most excellent giveaway! Thanks for the opportunity! I LOVE your recipes! I would love to win one of your cookbooks!! Cookbooks are my favorite things to buy or -- if I'm lucky! -- win. One of yours would be amazing. Thanks for doing this! Would love to have another of your cookbooks. Have Eat Drink and be Vegan and use it often as my inspiration. Fantastic- always delicious! ED&BV is one of my favorite cookbooks EVER! I also have VLV but I don't have Everyday Vegan so I'd love to win a copy! And I can't wait for your new cookbook!! Dreena, the only recipes of yours that I've made come from your blog, as I don't (yet) own one of your cookbooks. The ones I have tried are fabulous--my husband asks for a batch of your chocolate chip cookies every week! Oh, I hope you pick me, I would love to have a copy of Vive le Vegan, which I borrow regularly from our library. I frequently make your recipes from Eat, Drink and Be Vegan and would love an addition to my recipe books! Your recipes always are liked by others (meat eaters) and are requested during the holidays. Those jerk chickpeas look amazing! I do already own all of your cookbooks, but my recently-turned-vegetarian mother only has one of them, so fingers crossed! I would love to win this. I have Vive and use it often. I love your use of a variety of whole grain flours and legumes. Great giveaway, thanks! I don't have any of your cookbooks, believe it or not! I'd love to win one! I'd love to add another one of your cookbooks to my collection! Or to have one I could give as a gift... I know quite a few people who would be happy to get such a gift! I've been good all year, I promise, and I'd love to have one of your cookbooks! We love your cookbooks and now that my daughter has gone vegan she would really enjoy using one of your cookbooks. I love your recipes. I've got your baking book and I've tried a lot of the recipes that you post on your blog. Your recipes are really good; I can normally make my dish look exactly like yours. That doesn't happen with most others. It makes me feel like a successful chef. I love your cookbooks. You inspire me! Happy Holidays! That cake! Oh my word... Surprisingly I don't have ED&BV anymore - my sister and I shared it when we lived together and somehow she got it when I moved away! Unfair! Every time I tell a friend about a new recipe I have tried she asks where I found it and I say ....name one of your books here. So I will definitely be giving the book to her if I win. I would love another of your cookbooks - I love the one I already have! I've been coveting Vive le Vegan for quite some time! Also, dang, that cake is gorgeous. I would love to win this! I'm such a fan of yours. Ooh! I haven't had a chance to pick up The Everyday Vegan yet. I have your other two and would love the complete set! Oh... pick me, pick me!! I would love one of your books!! I don't have any of your cookbooks and I would love to have one! I have checked them out from the library before, but I want to own them!! Can't wait till your next cookbook is out! All three of your books are the first I go to when looking for a great meal. You are a one of the most creative "Muses" of the culinary world! I would love to win one of your cookbooks! I'm always looking for vegan inspiration! I would love a new vegan cookbook. Hi! I have Vive and E, D & B and could not love two cookbooks more. I would love to finish out my collection with The Everyday Vegan. Thanks! Love your books and your blog! I'm a fairly new vegan and in desperate need of some recipes so I would love to get your cookbook! I was going to ask for it for Christmas anyways! I would love one of your cookbooks! And thanks for including more gluten free recipes! I would love love love to win this!! I would love a copy of any of your cookbooks! Wow! I would really like the recipe for the jerk chickpeas. They looks so amazing. I will keep an eye out in case you post it soon :-). Oh goodness, would love to win this book! I was just asked by the doctor to start with gluten-free, and it's been rather difficult being both V & G-Free in this town. Thanks so much for the consideration! Vive le Vegan! is my go-to cookbook for cookies, and I have made several batches already this "holiday" season. But hey, I could stand to develop some new favorites! I love the cookie recipes in Vive and would love to expand my repetoire!!! Great giveaway! I'd love to win any of your cookbooks! Ooooh I don't have one of your cookbooks yet...but I'll just bet they are everybit as good as your blog! lovely giveaway! You had great pics of your good eats! I want to win this! I'm a new vegan (celebrating my 6monthiversary on new year's eve!) and I have a vegan boyfriend and 3 year old who would love some new treats! Oh my stars! All of those photos look so good. The jerk chickpeas and lemon cornmeal cookies sound especially good. I am would love to win one of your cookbooks. I was going to put them on my Christmas wishlist anyway! Ooooooh, how exciting!! I own ED&BV, but I would love to own one of your other books too! I don't have any of your cookbooks yet and would love to have one!! I'd love to be in the drawing. Although I own all of your cookbooks, my Vive is literally falling apart from overuse and is in desperate need of being replaced. Ooo, would love to own your book! I would love a new cookbook. I have ED&BV and have always wanted another! I'd love to own a copy of Vive le Vegan! The only one I don't have is Vive la Vegan. The others are my kitchen bibles! Thanks for all your thoughtful, well-described recipes! My three little boys, husband and myself have been vegetarian for a few years, trying very hard to be vegan. Would love one of your cookbooks. We do not have any vege cookbooks in our house- so this would be wonderful! Merry Christmas! My family would love to win! thanks for the giveaway! I'd love to learn more about vegan cooking and share it with my family. I am super excited!!! A yummy GF cake AND a cookbook giveaway? Makes me feel good in my pants. I only own Viva Le Vegan and your other books have been on my list forever (FTR, the last cookbook I bought WAS Viva Le Vegan, lol). Anyway, I'd love to win. I never win these things, but if I did, it would be groovy. OH YUM! Please, i really want your third book! I got the 2nd one! I would like to have your cookbook. Pick me! Those dishes are very delightful by the way.